As you begin to investigate, you encounter strange ghosts from the past. Find out what caused their rift all those generations ago and how you’re connected to this place and its spirit. This is a special Collector's Edition release full of exclusive extras you won’t find in the standard version. As a bonus, Collector's Edition purchases count toward three stamps on your Monthly Game Club Punch Card! 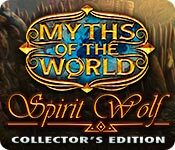 Myths of the World: Spirit Wolf Collector's Edition is rated 4.2 out of 5 by 58. Rated 5 out of 5 by Mickey107 from No need to buy CE This was a great game all around. Sadly the CE was a waste of extra $. The SE ended well and nothing was added in the CE. Actually the bonus chapter was repetitive and I did not enjoy. Rated 5 out of 5 by tutortime from Great Game. Worth the CC money. The bonus chapter was interesting and the story line fit in with the game. 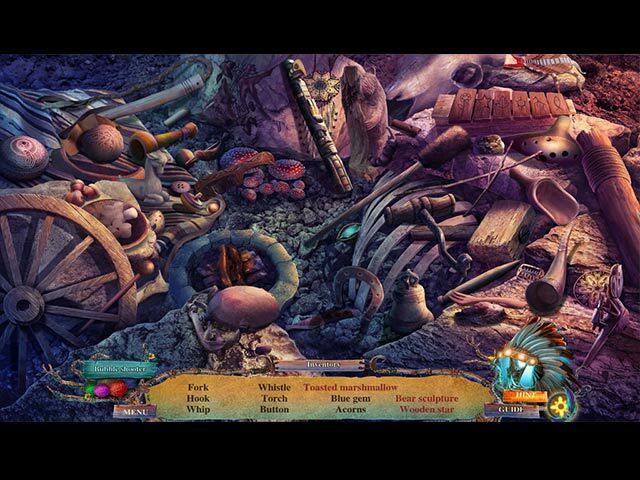 Rated 5 out of 5 by tpastor from Myths of the World: Spirit Wold Collector's Edition Best game I have purchased so far. Enjoyed playing the regular game as well as the bonus game. Rated 5 out of 5 by rosekaufmann from LOVE THE ALLURE Compelling music and opening scene with terrific narration. Good voice overs. Game grabs your attention at the beginning and it doesn't wane. BASICS: Map with objectives (unless turned off). You have 4 difficulty modes, one of which is customizable so you can choose what help you want, set HOS penalty, recharge and skip time. The customization seems to be the norm lately, and I'm glad. It should cut down on people not liking a game because of difficulty settings. GAMEPLAY: Sound effects and visual effects (though few) are spectacular. HOS are list or silhouette based and interactive; mildly crowded but very detailed. One minor irritation is that the feathers from the hint system are easy to accidently click when trying to click on an object in that area. You can play bubble shoot if you don't want to play the HOS. Well-developed storyline (won't repeat what others have already said, but I like it). Puzzles are varied in type and difficulty. Fun to do. Not particularly linear gameplay, but you do have to do certain actions to progress (such as to open up a HOS). Good production values. Wonderfully entertaining. CE Extras: replay the mini-games and HOS, watch the making of the game, cutscenes, achievements, and all the usuals. Rated 5 out of 5 by Agnes_2810 from A real Collector's Edition Based on the finished game + bonus chapter (written by a non native) A very beatiful game with full of extras. The bonus chapter is not somehting "must-be-so-we-have-to-add-something-to-the-main-game". It was full of very original ideas, and also very well made. The collectibles: you can collect them also after finished the game. That makes for me the only sense, because if the game is good, I always totally forget the signs or what ever I have to find. But here you can go back to the scenes, and collect the forgotten ones. I liked it!!! Souvenir exhibition opens after the end of the bonus chapter, it's also so much fun. 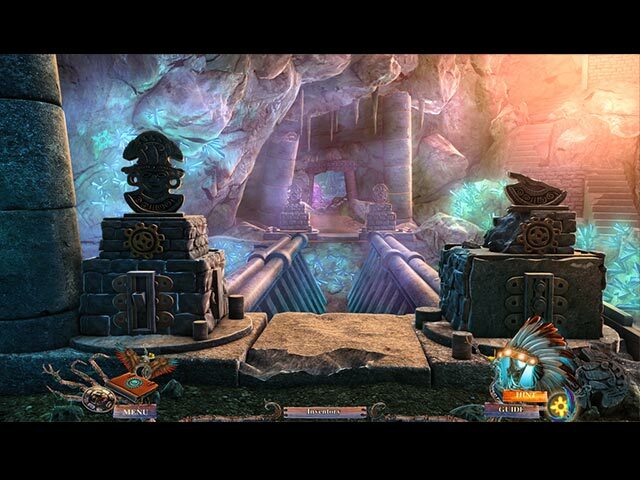 And the main game: usual Eipix quality. Very well made, clear and beautiful graphics, interesting and long story. I liked the charachters also. So if you're still hesitating, buy the CE, it's really something special! Thank you very much BFG and Eipix, I had a really good time with this game. Rated 5 out of 5 by judeejuju from Simply Superb! Fabulous game from beginning to the end of the bonus chapter. Well spaced HOs, good puzzles and game play which had me enthralled...can't wait for the next one. Rated 5 out of 5 by nospaceleft from Newest "Myths" game, still easy and fun This is the latest of the "Myths" games and the last I played. The process hasn't changed and the games are all well done. Illustration is nice and the puzzles and HOs are clear. None of these games are for deep thinking...and I enjoyed a little respite from that. I admit I looked at the guide a couple of times, but even with that it was more my impatience than the level of difficulty that caused that "cheat". I don't think I would have purchased the CE except that I was enjoying the simple pleasure of the other two and didn't want to wait. But, the only real help might be the map because it shows where work is needed and can zap you there. Even that is not necessary as the distance between areas of needed work are short, All in all, a nice group of games! Rated 5 out of 5 by imjustjean from Good for the long run This game kept me going for a long time, it is a rather large file game. Good graphics, plenty of challanges. I would really suggest this game to all.The bonus game and the little extras make this even a bit more fun. Rated 5 out of 5 by TabithaMoon from Nothing negative can be said! (almost) I love these Myths of the World games! They are incredibly fun, challenging but not too challenging, and are different than any other HOG out there! I'm not a huge fan of HOGs but the art and story lines keep bringing me back to them. These Myths of the World games are a great solution to people like me. When an HO scene comes up, you don't have to do them! You have an option of bubble shooter (or match 3 in the other versions). I was having so much fun not being forced to do the HO scenes that I enjoyed the HO scenes more when I did choose to do them. 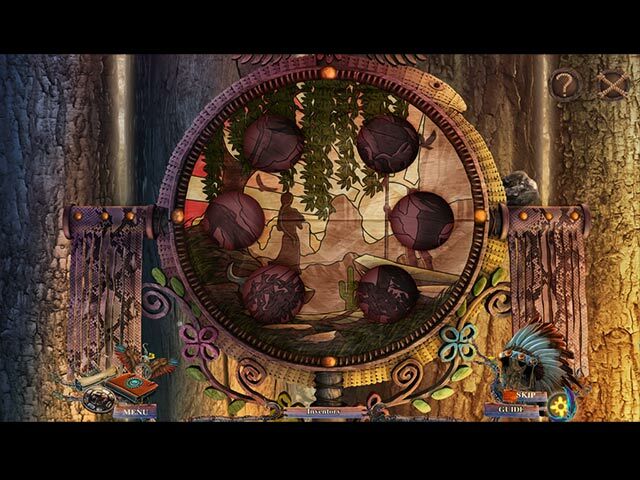 The sound is beautiful, peaceful, and puts you in the perfect setting for the game's subject matter, just like all of these Myths of the World games. The art is beautiful and clearly rendered so the artwork never gets in the way of completing a task. The only negative thing I can say is that the scenes where the amulet has to find the symbols in a darkened room were technically unsound. I don't know if the problem was on my end or if it is in the game, but whenever those scenes came up (3 if I remember correctly), only a rectangular section at the right hand side of the screen was clear. The rest of the screen was jumbled with computer lines. I found that if I escaped the scene and exited to the Main menu, this somewhat fixed the problem but not completely. The strategy guide helped me locate the symbols that were not showing up because of the weird malfunctioning screen. I am really looking forward to a 4th installment of Myths of the World! I hope they do Greek myths and Ancient Egyptian myths. Druids would be nice, too, and Viking! As a descendant of Eiric the Red, I only ask that if they make one for Norse mythology, they do NOT put horns on the helmets! That is a myth within a myth lol! Anyway, great game! Try the hour trial but seriously, you won't regret buying this or any of the Myths of the World games. Not even if you splurge on the Collector's Editions. They are well worth it! PS: Oh! I almost forgot! Do NOT exit this game at the end without reading the credits! This goes for all the Myths of the World games! The creators make funny notations beside each of their job descriptions. Some make you really laugh out loud. You get an achievement for watching through to the end, too. "Thanks" to the design team for that last bit of entertainment that shows you really enjoy your job and have fun bringing us quality games! Rated 5 out of 5 by jesuitwitch from love the respect in this one for Native Americans The art and graphics in this are terrific, the storyline held me through to the end. I really like a game that features a different culture. Didn't realize till I played this one (and I play lots of these games) how little racial diversity there is in this world. I strongly suggest that players sit through the credits at the end. They are hilarious. Thanks for this one. p.s. I'd like to see more games in which ravens aren't used to represent evil.